I believe that breakfast is the most important meal of the day. It sets our body up with the right energy it needs to carry out all of our daily tasks. A sugary breakfast will result in blood sugar levels that are constantly imbalanced for the rest of the day, while skipping breakfast will confuse our body’s metabolic levels. 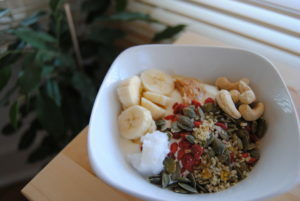 Often I create a “breakfast bowl” by putting a mixture of things together . In this case, it was cashews, hemp seeds, coconut oil, bananas, goji berries, hazelnut butter, plain yogurt and ground flax seeds. This is a great breakfast if you’re trying to avoid gluten but are used to eating toast and cereal. If you are also trying to avoid dairy, yogurt is often not as troublesome as dairy. Since it’s fermented it contains that enzyme that breaks down lactose, which usually is what causes the problems. The nuts and seeds provide healthy fats, while the ground flax gives us fibre and omega 3’s which are essential fatty acids that we must obtain from the diet. The plain, organic yogurt gives the body healthy probiotics and the bananas have potassium which our body needs on a regular basis. The coconut oil is amazing for our skin and also kicks the body into fat burning mode. 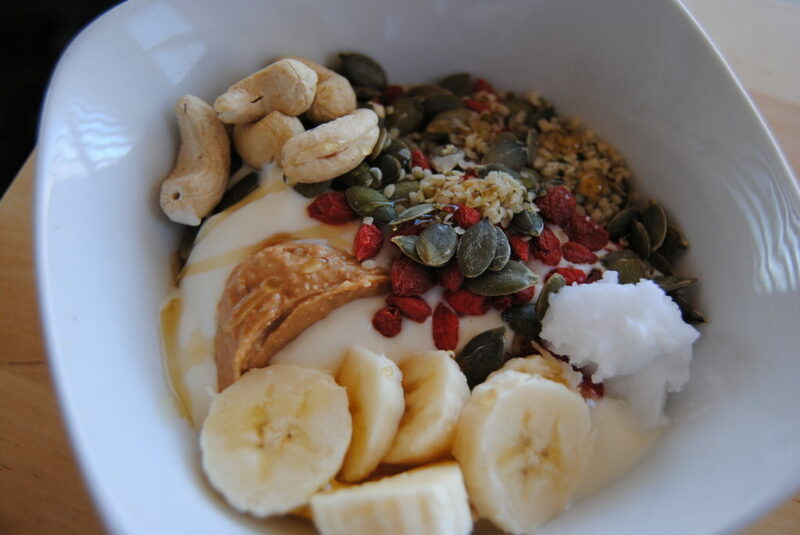 Try making a breakfast bowl tomorrow for your morning meal. It can also be eaten as a snack as well!